Application: Application: The attached lining ensures Arthricur for optimal muscle metabolism and a strong blood flow to the muscles and joints. By this action Arthricur is applicable to muscle stiffness and muscle injuries, especially in tension and back pain. 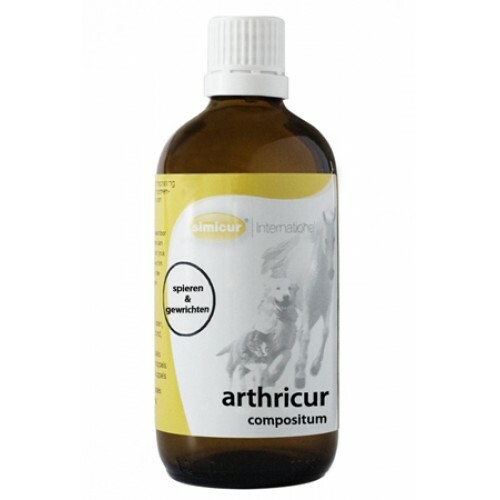 Furthermore Arthricur is indicated for tying up, muscle tears, bruises and shoulder lameness. By enhancing the blood flow to the joint capsules Arthricur is also the proper remedy for the treatment of stiff joints due to osteoarthritis. Effect: For back pain and muscle cramps after heavy exertion can occur in the muscles through inordinate accumulation of toxins (lactic acid). To stimulate metabolism and blood flow to the muscles and increase the removal of toxic substances by the kidneys, Arthricur is extremely suitable for use with stiff muscles and myopathy. Osteoarthritis is a chronic inflammation and deformity of a joint. This is caused by the accumulation of toxic metabolites in and around the joint. By increasing the blood supply and removal of these metabolites Arthricur is the proper means for stiff joints caused by osteoarthritis. Note: In order to promote the appetite, it is recommended to administer Gastricur on a piece of bread half an hour before feeding. Inject colic every half hour 4 ml Gastricur the mouth, just as begleitene therapy. Colic is always life-threatening consul animals a vet immediately!